Parentous is one of India’s largest platform for parents, and the go-to place for everything when it comes to parenting. It may be tips, experiences, skills, or just some support and this-too-shall-pass assurance. Over the course of Parentous’ existence, we’ve gleaned some amazing knowledge through the wonderful articles sent by our contributors. 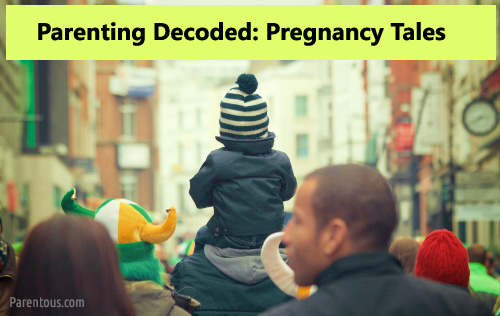 We think it’s time to share this knowledge with you in one place, so we’re starting the ‘Parenting Decoded’ series. This series will cover almost all the topics related to parenting, so keep your eye out for our future posts! We kick off with the obvious topic – pregnancy and childbirth, where it all begins. The first time you come to know you’re expecting, all the happiness and nervousness of those 9 months and uncountable firsts – we have all the parenting tips. 1. When are you giving the ‘good news’? The pregnancy story starts even before you’re actually expecting, all because of elders’ expectations about you expecting! As soon as you get married, people expect you to start producing cute little babies for them to fuss over and you to spend sleepless nights caring for. Gauri Venkitaraman talks about her personal experience with such well meaning (?) albeit, inquisitive elders. 2. Why do we have kids? After getting married, one of the most important discussions that a couple can have is about having kids. So why do you have kids? To pass on your genes, to strengthen your bond , or because everyone around you is having them? Bindu Manoj discusses the issue. What do you do if you’re unsure about having kids? You consult your friends and elders and then take an informed decision. After all, having a healthy, happy and well-provided for child is more important than having a child just because you’re expected to, right? Let Prasad NP’s post serve as an example. 4. Oh God! I’m not ready! It’s always good to think about whether you’re ready to have kids or not, but what happens when this question arises once you get pregnant? Doesn’t sound like an ideal situation, right? All you can do in such a case is make the best out of the situation, and do what feels right for you, like Vinita Bahl did. Do you remember the time you first found out that you’re expecting? Of course you do, these moments are unforgettable ones. Let’s take a peek into Jyothi’s mind in her journey to realizing the fact that she’s a ‘parent’. Contrary to the earlier trend of having children in their 20s, more and more women are choosing to delay pregnancy till their 30s or even their 40s. There are certain risks associated with late pregnancies, but this trend also has certain advantages. Ritu Lalit and Sunita Rajwade both have written about this phenomenon, so read on to know their take on the subject. Pregnancy is a great time for the to-be mother, with everyone cooing over her and pampering her. After all, she’s carrying a precious bundle of joy inside her! It’s great to enjoy all the attention showered on you, but in addition to that, you should also take care of yourself in these 9 months, as Shubhangi says. When you’re expecting, all the help you can get is welcome. This help can come in the form of relatives, your doctors or even books! You can refer to the books at any point, and always go back to them. Here are some books that will come to your rescue in this period of unnerving changes, as suggested by Divya and Nidhi. Books too cumbersome for you? Use the digital boom to your advantage by downloading one of the many apps that are made specially for expecting parents. Let this article by Archana Karkera help you pick the best apps to keep track of your pregnancy and get some precious tips. When you announce your pregnancy to your close ones, first come the congratulatory hugs and then comes the advice. Do this, eat this, don’t do this, in our time we used to do this, etc. Standing under a shower of such advice, most of which is myth disguised as opinion, can get exhausting. You’re not alone, as these blog posts by Nidhi and Sirisha will tell you. If you think the 9 months of pregnancy are a time of resting before the big event of childbirth, you’re wrong. These months fly by in preparing your life for the huge change of caring for another life. You can make your job easier by making a list of things that you’ll need when the baby comes. Need help? Here’s Debolina’s list to get you started. So you’re all set to welcome your baby and have read up on almost any situation that you can encounter. Now what? Now comes the bit about childbirth. Most expectant mothers are at least a little apprehensive about giving birth. Archana writes about hypnobirthing, a technique that will make your childbirth journey smoother and more pleasant. Bringing a baby into the world is a huge deal, regardless of the method of giving birth. Still, we find some judgment reserved for mothers who give birth via Caesarean section. Anne John writes about this, and questions the need to divide moms into ‘natural birth’ and ‘C-section moms’. 14. Over to you, dad! Daddies, listen up! Pregnancy is one of the most demanding parts of your wife’s life, rivaled only by child rearing. (We’ll come to that later) The point is, if your wife wants you in the delivery room during the labour, you should be there, even if you’re squeamish. Let Sid’s journey from ‘Umm..no’ to ‘Of course yes!’ be your guiding light. This topic is a not so pleasant part of pregnancy, but a bitter truth nevertheless. Sometimes with the happiness and thrill of pregnancy, also comes the sadness of losing a baby. It is important to know that even if this grief seems insurmountable, it is possible to cope with it, and more importantly, people who go through this are not alone. Read these posts by Sapna and Shubhangi to know more.